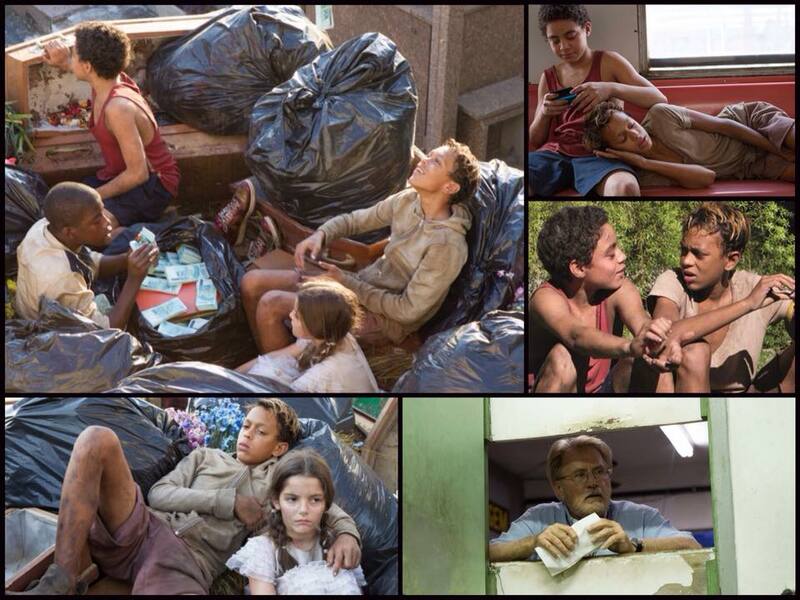 Stephen Daldry’s Trash remains a bit of a mystery. It has major studio backing (Universal), a director with a fine pedigree for creating well received films (Billy Elliot, the Hours, the Reader). While it boasts stars (Rooney Mara (The Girl with the Dragon Tattoo), and Martin Sheen (pick any of a dozen movies)) who aren’t exactly A-listers, they aren’t exactly non-entities when it comes to attracting viewers to small films. Yet the movie appears to have been shelved for US release after its UK premier. Uncertain why, and having very much enjoyed Andy Mulligan’s 2010 young adult novel of the same title from which the film is adapted, I decided to use that handy device known as the Internet and our trusty ol’ mail system to track down a copy to see why that might be. Trash is a proletarian adventure story set in Rio de Janeiro. It follows the lives of three boys, Rafael (Rickson Tevez), Gardo (Eduardo Luis) and Jun-Jun (Gabriel Weinstein), who live and work in a garbage dump outside the city and find a wallet in the trash that puts them at the center of a corruption scandal that affects high ranking government officials and puts them on a race to find a stash of money before the police capture them. That Brazilian setting differs from the novel, which tries to remain unspecific in locale to tell a more universal story, although it does not take much guesswork to figure out that the novel is set in Manila. The movie, like the novel is first and foremost an action/thriller, but as a young adult story targeted to 11-13 year old readers, the thriller has training wheels on. It is meant for readers who may not have encountered well-worn plot devices like book codes, and who probably aren’t familiar with the ways corruption and police brutality work around the world. I wasn’t shocked by the story, jaded as I am, but I did enjoy the novel as an adult mainly because the three lead boys are so vividly drawn that one cannot but help but root for them. Rambunctious brandy drinking, smoking, church robbing, cursing urchins, indeed. If Daldry has done anything with this film adaptation, he has captured that contagious energy of the three leads, and it is their performances that lead me to recommend the film. Action-filled without the need for explosives and fast cars, this is an action film with kids that I can actually get behind because based on the setting of the film and the circumstances characters, it is never a given that all three will make it through to the end, let alone succeed in what they are trying to do. When the film opens, Rafael is holding a gun to the temple of a man (Selton Mello) while his friends call out for him to shoot the man and move on. We don’t know how that scene ends until much later in the film, which generally follows the novel, until that scene with the gun, which is nowhere to be found in the novel. I think that scene points to the problem that the film will have finding an audience – it can’t decide whether it wants to be a film geared toward young teen viewers or one that is for adults that happens to have children in it. If the latter, there’s no problem with an actor that young actually pulling the trigger, but if he does, there’s very little chance that the film will receive the PG-13 rating necessary to reach the intended audience in theaters. If he doesn’t pull that trigger, well, why give him a gun in the first place, since that gun will put our rating powers that be on high alert immediately? Parents don’t exactly take to morally ambiguous child anti-heroes, unfortunately, even likable, boisterous ones, which is why I guess the film is going to sit awhile waiting for a US release. It was always going to be a stretch to find an audience for kids who don’t mind watching a movie in Portuguese in the US market, anyway. But as it stands, it isn’t adult enough for adults or kid enough for concerned parents. That doesn’t mean it isn’t worth seeking out if you can find it. The other problem I had with the film, which actually is causing me to shave off a ratings star, is the elevation of Sheen’s and Mara’s characters within the film to give the film a liberal fantasy ending. Sheen plays an alcoholic priest, who, while he means well, is too overwhelmed by his years of service to actually learn to speak Portuguese so that he can fully minister to his flock. Mara plays Olivia, a recent college graduate who has come to the parish school help out in the mission teaching English. The boys assume she is a nun or a social worker because she works for the Church, but she really doesn’t have much formal training. While both characters are concerned and inspired by the people’s poverty, they really aren’t more than representatives of the broader institutional failings that keep the people working in the garbage dump for generations. I mean, if I was a bishop interested in maintaining the current oligarchy, I would be more than pleased to have such a parish priest working in the poorest district in the city. In the novel, the priest is reduced to the role of a scribe, recording the heroic actions of Rafael and his friends, who manage to do something that he hasn’t been able to do with all of his calls for funds from the Church. “Sister” Olivia for her part is escorted out of the country with her naive eyes opened as to just how much the world can be corrupted by money. Unfortunately, we can’t have stars floating around a film with nothing to do, so in the end, priest and “nun” create a YouTube video that sparks street protests calling for social and economic reforms (revolution even) that I guess should make us feel that they boys’ efforts were truly worthwhile and give us relatable White characters doing positive things for the poor in other countries. I don’t think the ending fits as well with the film as Daldry would have us believe, and it appears to be pandering a bit too much. Fast forward though that part, and enjoy the ending the boys actually created for themselves, as far away from the front lines of the “revolution” as they could possibly be. This entry was posted in Action, Brazil, Foreign, movie reviews, UK and tagged 2014 movies, action film, brazil movies, drama, movie review, review, Trash (2014 Film), UK Film. Bookmark the permalink.